"Fancy Dish" - anyone done it? Thread: "Fancy Dish" - anyone done it? Saw a picture of it a few years back and have it in my "to do list". Actually ordered the book today! Going to be a doozy isn't it? Anyone tackled it yet? Enjoy your day! Thanks Debra! Let's say I'll try anything! After Labyrinth Walk I know I'll never do a Log Cabin or a Bargello! Straight lines don't like me! Still doing DJ - hand quilting and QAYG. I love it! 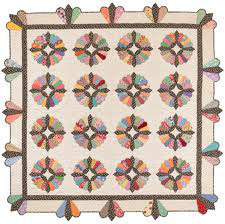 I think I would do every quilt it shows in the preview on Amazon. Please keep us posted. Have all the stuff for it, but haven't cut it out yet. It has been in the "get it all together first" mode for about a year now. Hopefully, will be able to cut it out in the next week or two (if I can keep my house cleaning schedule on track). Me, too Lisa! I like the 4-petal? flowers one with the echo quilting! Page four. Last edited by Kitsie; 08-02-2013 at 10:16 AM. THAT's the kind of Dresden I want to make! !